'ND Palomino' slow darkening pinto bean was jointly released by the North Dakota Agricultural Experiment Station and the USDA-ARS in 2016. 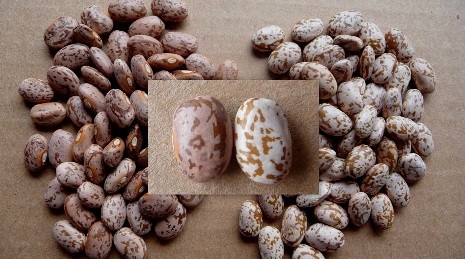 'ND Palomino' slow darkening pinto bean offers the slow darkening trait and competitive agronomic performance. 'ND Palomino' has an upright indeterminate (short vine) growth habit (Type IIa), white flowers and matures in approximately 102 days. Agronomic performance and seed color, size, and shape are within acceptable commercial ranges of popular pinto bean cultivars grown in North Dakota. Tested across 22 locations in ND and MN from 2012-2015 ND Palomino’s seed yield was similar to Stampede and Lariat. ND Palomino is resistant to Bean Common Mosaic Virus (BCMV), but susceptible to rust race 20-3 and anthracnose race 73. Susceptibility to bacterial diseases such as common bacterial blight and halo blight is similar to the commercial checks. Canning quality for ND Palomino is within acceptable commercial ranges. NDSU strongly encourages the segregation of slow darkening pinto beans from conventional darkening pinto beans. Care should be taken during harvest and seed handling to prevent mixing. This variety is protected by the Plant Variety Protection Act of 1970 as amended in 1994 (“PVPA”). The PVPA prohibits, among other things, the propagation, multiplication, production, sale, use or advertisement of this protected variety without either an assignment or license from the NDSU Research Foundation.